Choosing the right restoration cleaning products depends on the material composition, surface texture, the nature of residue and the severity of soot contamination. Clean in preparation for paint only. Clean in preparation for sealer and paint. Traditionally, wet cleanable surfaces include most woodwork, doors and doorframes, and semi-gloss and gloss painted surfaces. The coating components of acoustical textured (popcorn type) ceilings will deteriorate when cleaned with aggressive cleaning techniques. Two structural areas where the restorer will find the most washable surfaces are in the kitchen and bathrooms. 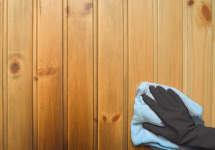 Prior to cleaning smoke damaged surfaces, secure breakables from furniture, and remove draperies, wall decorations and framed articles to prevent damage. The one exception to this “top to bottom” approach is walls. Usually, the best direction for washing painted walls by hand is to wash from bottom to top. This will help to reduce streaking.